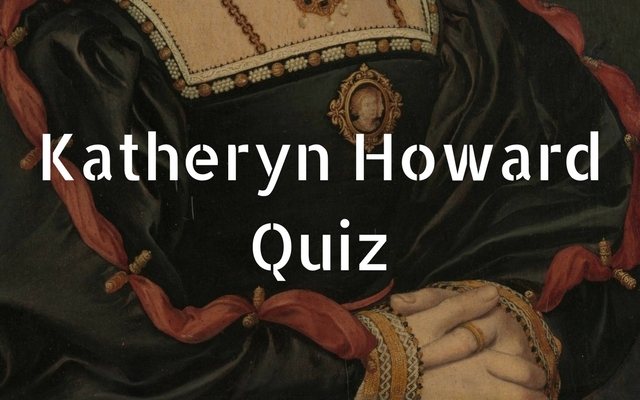 She was the fifth wife of King Henry VIII and a member of the prestigious Howard clan – how much do you know about Katheryn Howard? Which palace did Katheryn wed Henry VIII on the 28th of July 1540? Henry and Katheryn were married at one of Henry’s favorite hunting lodges, Oatlands Palace. Did Katheryn Howard meet Thomas Culpeper BEFORE or AFTER she married Henry VIII? Great job! Many believe, as portrayed on The Tudors, that they only met when Katheryn was already Queen. The couple met at court prior to Katheryn’s marriage to King Henry. Katheryn’s mother Joyce Culpeper was married twice – between the two marriages how many children did she have? What was the name of the girl who shared a bed with Katheryn at Chesworth? Great job! You really know your stuff. What is the significance of the 22nd of November 1541 for Katheryn Howard? She was moved to Syon Abbey. She was stripped of the title of Queen. She was interrogated by Archbishop Cranmer. The day she lost her mind. Yes! It was on this day that she was stripped of the title of Queen. It was on this day that she was stripped of the title of Queen and would be referred to only as Katheryn Howard. Katheryn’s sister Isabel was appointed by the council as one of the four ladies to accompany the Queen to Syon Abbey – why is it believed she was appointed? Katheryn needed family around during this difficult time. Isabel and her husband relayed reports of Katheryn's behavior to the council. Only a close family member could dress a Queen. She was like a mother to Katheryn. Which of these two ladies were threatened multiple time to be removed from the Queen’s household? Which three locations did Queen Katheryn admit to having late night meetings with Thomas Culpeper at when she was being questioned? Eventually the Queen did admit to late night meetings with Culpeper at Lincoln, Pontefract and York. On which day was it said that Katheryn and Thomas Culpeper had a disagreement that caused them to not speak to one another for a extended period of time? What was the first stop in the summer progress of 1541?